Professional B2B and SaaS writer with an affinity for GIFs. The customer may have always been right – but they’ve never had the kind of reach they do today. Review sites are at their literal fingertips. Powered by social media, both good and bad feedback about your business can spread like wildfire. And there’s the flipside: people looking for a restaurant, a mechanic or even a school rely on reviews to fuel their research and inform their ultimate purchase decision. 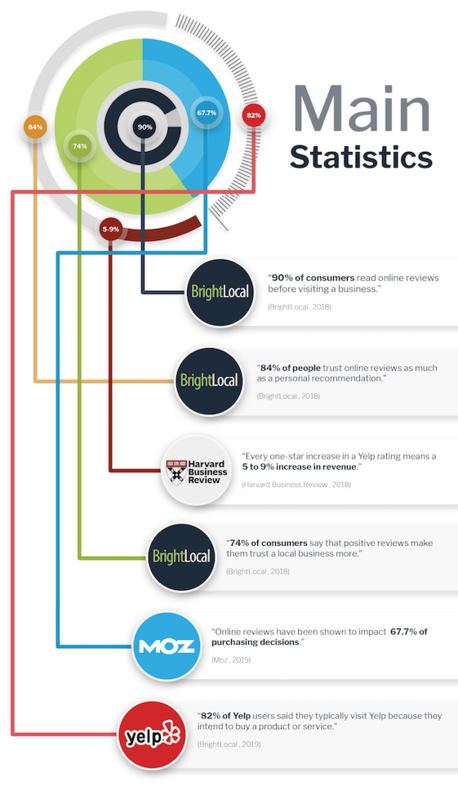 More than 8 out of 10 people trust online reviews just as much as a friend’s recommendation. They just trust them more than sales language, no matter how well written or well-intentioned. There’s an argument to be made for the value of bad reviews. They can help you improve customer service or make product tweaks. But negative reviews still negatively affect your public image. Bad feedback is helpful to your business’ approach; bad reviews are hurtful to your business’ image. In this post, we dive into both sides of the same coin: how important customer voices are for building your business and how damaging bad reviews can be. And we have a bonus: going through the review removal process doesn’t have to be as complicated as you think. In recent years, businesses of all stripes have seen a shift in the way customers interact with their brand. Things have transitioned from individual interactions centered on customer service or products to an overarching, ever-present entity called customer experience. In the Amazon age, customers don’t just want a good haircut or delicious cake. They want an experience, complete with easy transactions, fantastic customer service, great products, quick turnaround and more. For better or worse, customers are bringing these expectations into brick and mortar retailers and service retailers. And, boy, are people ready to share their experience. Yelp, TripAdvisor, Facebook and a wealth of other community-oriented platforms have made sharing reviews easier than ever. Nearly two thirds of people see online search as the most trusted source of information about businesses – that’s a higher level of trust than any other online or offline source. Fair or not, people clearly love to use reviews – both positive and negative – as a signal of whether a business warrants their business. “Online reviews are the virtual version of word-of-mouth advertising, widely regarded the best kind of advertising a company can hope for,” writes Sophia Conti at RetailNext. But the reverse is also true: bad reviews are the virtual version of friends bad mouthing your business. So what is the real damage of bad reviews? There’s plenty of content out there discussing what positive, user-generated content can do for your business. But what about the reverse? There are a couple of major ways bad reviews can impact your business. First, a bad review can stick out like a sore thumb. For example, businesses risk losing 22 percent of business when potential customers find just one negative article on the first page of their search results. If that number rises to four or more, you’re likely to lose 70 percent of potential customers. One negative review can cause you to lose up to 30 customers. Second, negative reviews affect your aggregate score on platforms like Yelp and Facebook, which can have just as big of an impact on customer perspectives. Research from Harvard Business Review revealed that every one-star increase in a Yelp rating means up to a 9 percent increase in revenue. “Online consumer reviews substitute for more traditional forms of reputation,” writes report author Michael Luca. A negative review makes that increase much more difficult. Writing at Inc magazine, Andrew Thomas reports that it takes 40 positive reviews to negate the effects of one negative review. Thomas walks through the specific numbers, but essentially it boils down to the fact that someone with a negative experience is much more likely to share that experience than someone who has a positive experience. Only one out of ten customers with a positive experience will leave a positive review. “All of this makes for a good-to-bad review ratio that is virtually impossible to ignore,” Thomas concludes. Of course, this means you should focus on customer experience more than anything. But it also means going through the steps to remove a bad review can have a bigger payoff than solely focusing on garnering more positive reviews. The good news is you don’t have to resign yourself to bad reviews. Besides reexamining your customer experience approach, there are a couple of more triage, case-by-case steps you can take to mitigate the impact of bad reviews. The best businesses receive negative (or at least lukewarm) reviews. You should expect it and prepare accordingly. The key is to remain proactive in the feedback process by taking the time to respond to bad reviews authentically and quickly. “People are not looking for perfection online,” writes Shama Kabani, CEO of The Marketing Zen Group. “What they’re really looking for is humanity and a genuine response, so a negative review can be a great opportunity to respond in a positive and transparent manner. And that has a good impact on all your customers.” Showing your customers that you care and that you take the feedback in reviews seriously will go a long way toward negating that negativity. Don’t be afraid to remove negative reviews. It’s a critical part of your business’ reputation management. The removal process isn’t always warranted, but it’s always worth looking into whether removal is an option. If a review violates the platform’s Terms of Service, content guidelines or community standards you can submit a removal request. The process varies depending on the platform, but the end result is the same: a better aggregate and a better reputation for your business.